A worker using a high-pressure waterblasting gun to clean a tank was severely injured when he lost control of the gun and injected himself. His injuries required surgery. Although it may look like just a cut, an injection is a serious injury. You must seek medical treatment immediately and provide physicians with detailed information on the injected material. Check all components of a high-pressure water jet system to make sure they are the correct size, thread and pressure rating for the intended use. Ensure proper maintenance of high-pressure water jet equipment. Never leave the system unattended when pressurized. Ensure only workers who have been properly trained, who demonstrate the knowledge and skill, and are experienced to complete all assigned tasks operate high-pressure water jet equipment. Maintain a safe distance between the operator of the water jet system and other workers. Because the reaction force from operating a jetting gun can tire a gun operator, a supervisor should establish a schedule to regularly relieve the operator. Be especially careful when operating high-pressure water jet systems around electrical components. Before using the equipment, check all electrical boxes, connections, switches, cables and fittings for damage. Ensure that water cannot enter these components and they are not liable to be damaged by water or abrasion. Ensure the clearance between the outside diameter of the hose, lance and nozzle assembly and the inside wall of the item being cleaned is sufficient to allow adequate washout of water and debris. Use a jetting gun to clean the first 36 cm of the pipe and mark the flex lance to indicate 60 cm from the nozzle. 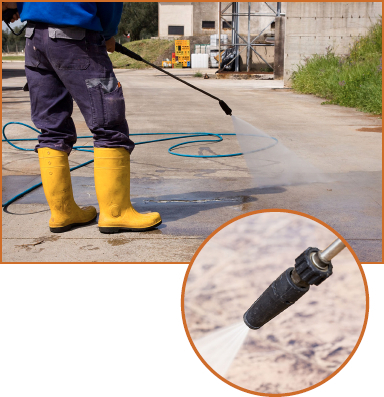 Avoid unusual or awkward positions to prevent losing control of the waterblasting equipment. Do not modify equipment without approval from the manufacturer or other competent person. Suitable head protection must be worn at all times at the worksite. This should include a full-faced shield. Eye protection must fit properly and provide the protection needed. Hearing protection, as water jets can be very noisy. Protective clothing should be waterproof, with an outer layer that repels rebounding water. It should also protect from the impact of rebounding debris from the jet impact point. All operators should wear plastic coated, rubber or metal-meshed reinforced gloves. All workers nearby must wear waterproof boots fitted with protective toe caps and metatarsal guards.